Always a (giant) crowd pleaser for any LEGO fan – making gigantic ‘things’ out of LEGO—this time it’s a Chevrolet Silverado pick up truck. Agreed it’s only because of a movie partnership – “The LEGO® Movie 2: The Second Part” – no less, we can all do with a little bit more of the bricks to play with. The students of the Oxford Community School’s FIRST LEGO® League and Detroit’s Ralph Waldo Emerson Elementary’s A World in Motion Program created this first-ever full-size LEGO® Silverado — unveiled in January at the North American International Auto Show in Detroit. 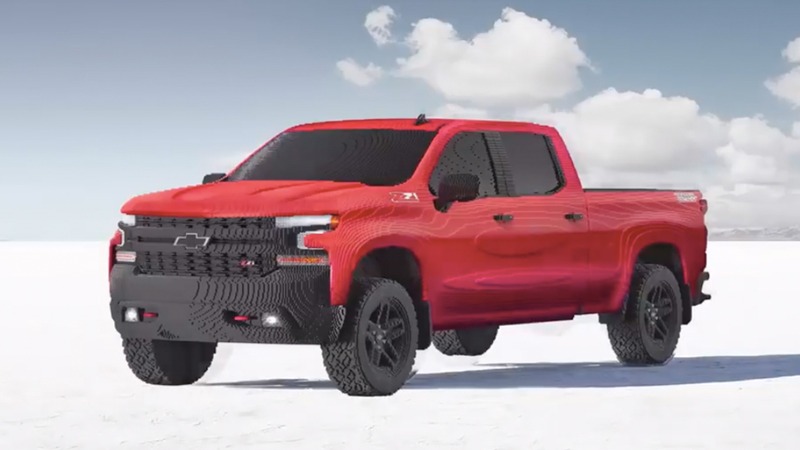 What makes the whole exercise even more impressive is that the team has managed to create a replica of the 2019 Silverado 1500 LT Trail Boss; a new edition to the Chevy family. In total, it took eighteen specially-trained LEGO Master Builders to dedicate about 2000 hours of their time to construct this red beauty. Their endeavors made them painstakingly select about 334,544 specific pieces that would suit the particular design needs of the brick truck build. And although you may not be able to fire up the engine, you will be able to work the unique working lights. You can also appreciate the graphic details added strategically to the design. The finished constructed model measures in at about 6-feet high, 8-feet wide and 20-feet long. This brick-car weighs about 3,307 pounds, which is quite a bit – 1500 kg! No prizes for guessing that the most commonly used brick was the red 2×8 stud brick. Constructed by the LEGO Master Builders in the LEGO Group’s Model Shop in Enfield, Connecticut, this model Chevy is undoubtedly a treat for any truck-loving LEGO fan.